← SEPTEMBER RUNNING DAY & DIESEL WEEKEND! Here is the timetable for this weekend’s event. Sorry it’s so late, we’ve had some challenges around crew availability that threw us a very tightly curved ball at the end of last week. Not an easy job! The DMU will be the Class 104. 08195 will haul the brakevan trips to the throat of Pentrefelin yard. 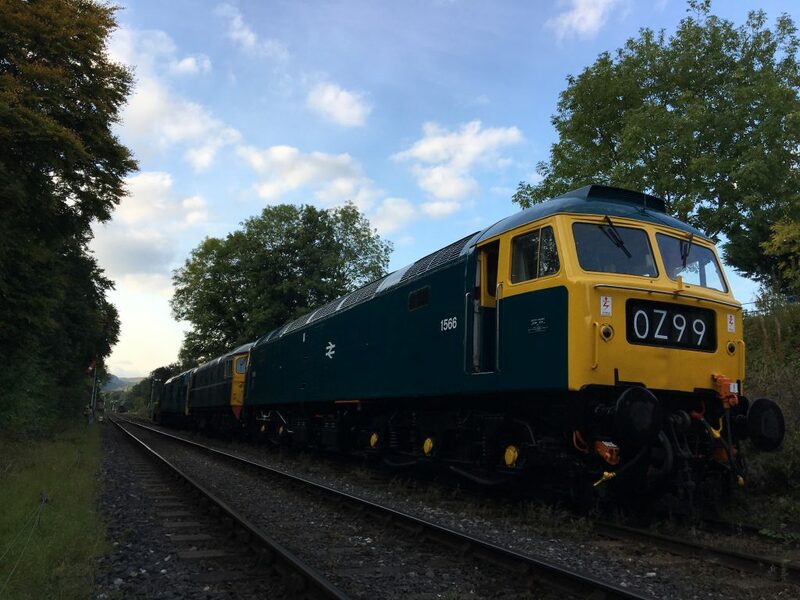 All 3 locos are ready for the weekend and final preparations begun last night -the photo below shows all 3 locos at River Sidings. D5310 and 1566 were run up and tested, 6940 has received repairs to some corrosion-related air leaks and a new section of cab floor. Some BR-era nostalgia and might-have-beens will be gracing coach droplights and the evening trains will see Travellers Fare partially dug-up from the corporate branding graveyard. The group are very much looking forward to our first full diesel event for 3 years and look forward to seeing you there.